Load up gamers. The season of the shooters (FPS) has officially begun. 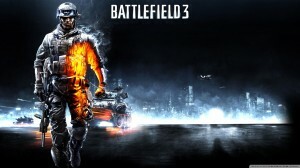 Battlefield 3 is finally here and the bar has been set for the competition, specifically Call of Duty: Modern Warfare 3. So does Battlefield 3 hold up after all the hype Electronic Arts has been building? The most impressive improvement is developer DICE’s new game engine, Frostbite 2. Frostbite 2 is truly a marvel of modern gaming technology, improving on the previous engine and displaying the most breathtaking visuals in any video game to date. The scenery is expansive and detailed with desert, mountain and city landscapes, making it feel as if you were actually surrounded by such a real environment. It’s extremely easy to get lost in the beautiful vista while playing an online multiplayer match. Destruction is also more realistic on bigger and smaller scales with debris and particles flying in the air and entire buildings collapsing in clouds of dust. The animations are more genuine, having been modeled after human behavior so precisely that it’s easy to think the soldiers have a mind of their own. They take cover and move fluidly, and they do it in a militaristic style. Unfortunately, the full-scope of Frostbite 2’s capabilities will be limited to those with a PC system. However, that doesn’t mean the game doesn’t look amazing without the highest settings. On the other hand, console gamers will definitely be getting one of the best looking games ever. A welcome addition to the game that old-school Battlefield fans will rejoice in is the return of jets to the vehicle options. Missing in the last two Battlefield installments, jets bring back the ultimate thrill in vehicular combat and are better than ever. Getting into dogfights with enemy players is the most liberating feeling in the world, and also contributes to the realism and scope of warfare. New gameplay elements were also added, with some drawing criticism from die-hard Battlefield fans. One of the changes is the ability for your character to go prone, which means laying flat on your belly. This has caused a stir among the Battlefield collective because they feel like it’s a move to appease the “Call of Duty” fans, as well as encouragement for camping and hiding from enemies. It may be a marketing ploy, but when you think about it it’s just another tactical option added to an already tactical and strategic game. How it affects online gameplay in the long run is yet to be seen. The multiplayer maps are exactly what you would expect from Battlefield: wide-open, vast and seemingly endless. The beta experience had many players worried about the map quality of the game, due to the map “Operation Metro,” which included no vehicles and was relatively small in Battlefield standards. Most doubts were cast aside when the map “Caspian Border” was revealed in the open beta, displaying all the signature qualities of Battlefield gameplay. Maps such as “Kharg Island” and “Tehran Highway” offer very large spaces in different environments, with one being set in desert terrain and the other in an urban city. Battlefield fans will rest at ease knowing their beloved franchise hasn’t abandoned its roots. When it comes to determining the best version of the game, the PC version claims the title. The developers had announced that the PC platform was the main platform they built the game around, and it clearly shows. Although it’s very clear the console version is superior to other FPS in its own right, it still has its downfalls. One disadvantage: the console version is able to support up to 24 players in a multiplayer match, while the PC version supports up to 64 players. This impacts gameplay in a significant way and will result in lesser large-scale battles. Battlefield 3 has taken the FPS genre to the next level with its evolution, while adding new aspects to appeal to new fans and bringing back old ones to keep the devoted junkies happy. In the realm of shooters, Battlefield 3 is one of the best.